Louth ensured their place in the league semi finals with an emphatic win over Derry on Sunday afternoon in Clan na Gael Park. They complete their campaign in Tullyallen next Sunday when they entertain Fermanagh aiming for a sixth successive win, which will set up a meeting with Antrim in the semi final. 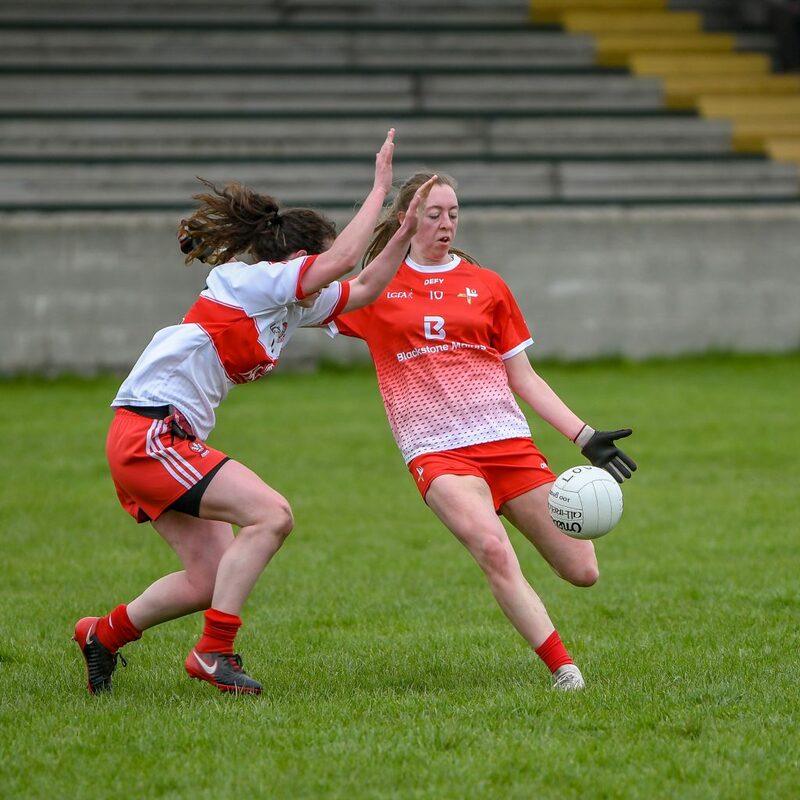 When these counties met in last year’s All-Ireland semi-final, Derry came close to causing a major upset leading for most of the second half and it took a late Kate Flood goal to deny Derry an appearance in the Croke Park decoder. This game never reached the heights of that Aughnacloy thriller with Louth quickly into their stride as Lauren Boyle hit the home sides first score after just two minutes, a brilliant low shot into the bottom corner giving her side the perfect start and the Cooley sharpshooter followed up with two points before Kate Flood added Louth’s second goal with a stylish finish in the thirteenth minute after a fine passing movement involving Sinead Woods and Lauren Boyle. 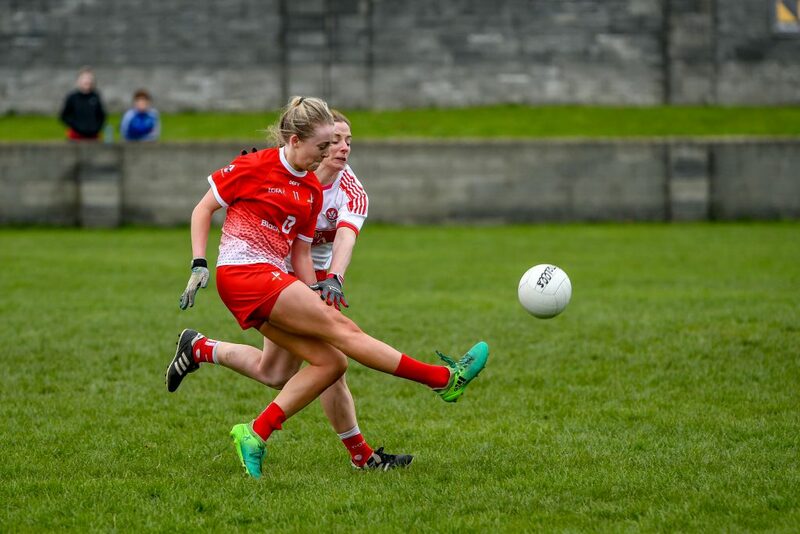 As the northern county struggled to e come to terms with Louth’s movement and slick passing the home side stretched their lead to eleven points as Kate Flood and Ciara Woods combined brilliantly to set up Eimear Byrne who lashed an unstoppable shot past Kathryn McNamee, giving the St.Mochta’s star her second goal in as many outings. Rebecca Carr added a point before Emma Doherty had the Oak Leak’s first score from a free in the twenty third minute. Louth replied with the last score of the half through Lauren Boyle to lead 3-04 to 0-01 at the break. To their credit Paul Crozier’s side never give up and were rewarded when brilliant approach play by Dania Donnelly found substitute Leonie McElroy in space and the Limavady player’s well hit shot nestled in the top corner. 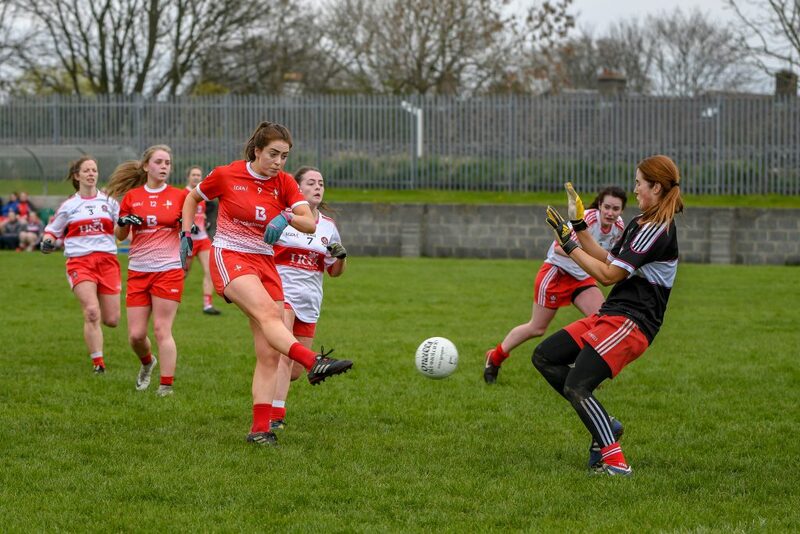 Louth responded strongly with goals from Clan’s pair Ciara Woods and Emily Norton with Alannah McLaughlin, Michelle McMahon and Aine Breen all raising white flags as Louth finished with a flourish. In a good Louth team performance, where their opponents didn’t score from play for forty three minutes, Sarah Quinn, Eilish Hand, and Ceire Nolan excelled in a strong backline while Emer Byrne’s workrate and strong running ensured the forwards saw plenty of the ball where Lauren Boyle was again in superb form, ably assisted by Ciara Woods, Aoife Russell, Rebecca Carr and Emily Norton. “I am very pleased with the result and performance from the player’s today as we knew coming into today’s game that it was going to be a tough battle. Although the scoreline might not reflect this, it was a tough game from start to finish and credit to the Louth girls as they put in a massive effort to ensure the victory and a semi final place. Subs: Emily Norton (1-0), Niamh Rice, Grainne Murray, Eimear Murray (0-1) Leanne Sharkey, Grace Treanor. Subs: Niamh McIlroy (1-0), Toireasa McIlroy, Hannah Mullen, Nuala Browne.